Now celebrating their 15th anniversary, KAB’s relationship with the music industry runs deep. For over a decade they’ve been spreading their message of prevention at the Vans Warped Tour via their Traveling Education Booth; a touring, interactive educational platform that teaches festivalgoers about breast cancer prevention through living a non-toxic lifestyle. It was during one of these yearly outreach efforts that they met Vic Fuentes, lead singer of Pierce The Veil, whom later shared first-hand experience with breast cancer (he shared his own deeply personal story on camera via KAB’s This Is My Story campaign in 2011). Armed with knowledge and committed to helping their fans, the band began advocating for KAB’s message during their live shows and educating about the importance of monthly breast self checks, quickly becoming one of the organization’s most vocal ambassadors. The #PTVLOVESKAB fundraiser is a way to create awareness around KAB’s mission, as well as generate funds for their programs. Looking to the future, the organization will continue creating innovative programming for men and women impacted by cancer with an eye on eliminating cancer-causing toxins in our every daily environment --- especially those linked to the initiation of breast cancer. “We want to inspire younger generations to have a different attitude about breast cancer prevention. 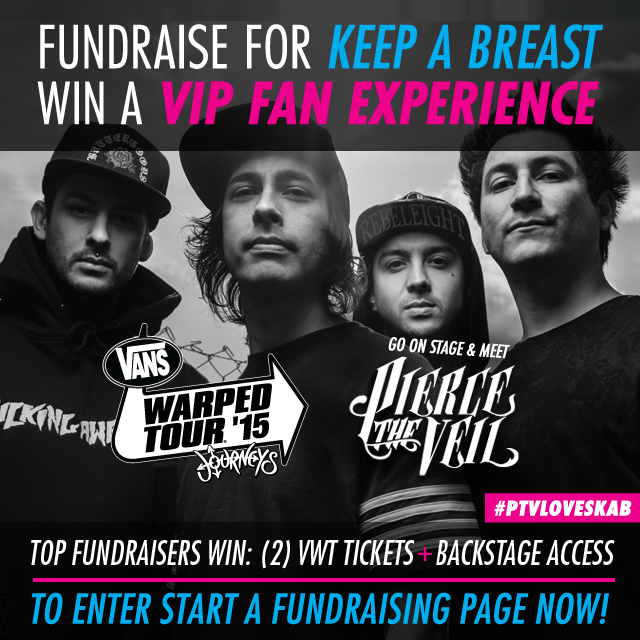 Our partnership with Pierce The Veil and the Vans Warped Tour is vital to our success.” said Shaney jo Darden, CEO of Keep A Breast. To set up a fundraising page or learn more about the joint fundraising initiative, CLICK HERE or see below! Download the free app to Set-up an automatic monthly reminder! The Keep A Breast Foundation(TM) is headquartered in the United States as a 501 (c) 3 nonprofit. We are supported in fulfilling our mission by international partners Keep A Breast Canada, Keep A Breast Europe, Keep A Breast Japan and Keep A Breast Chile.